Every year around this season of gift giving, I see lots of posts by writers and readers and online stores, advising people what books would make great gifts. Usually, these lists consist entirely of novels. I’m a big fan of novels, but I might be an even bigger fan of short story collections. But even I can be swayed by novel-fever, and in the past (not the recent past, but back when I did blog regularly past), even I’ve recommended buying novel A and novel B, etc. This year, I’m recommending three killer short story collections that I’ve read in 2011. Of course they’re all published by small presses, because the large press publishing industry has this idea that people don’t want to read short story collections. I think that’s a bit of a self-fulfilling prophecy, but that’s another blog post. For now, here’s my advice: buy these three collections. They’re awesome, and they each have killer covers. Maureen McHugh is well known in science fiction circles, mainly in the circles that admire high quality, character centered scifi. Back in the 90s, she debuted with a hugely awesome novel-in-stories (before that term was conceived of) called China Mountain Zhang (read that book, too!). She went on to write a number of other novels, and one other collection (Mothers and Other Monsters, also recommended), and has been spending time writing Alternate Reality Games and is now writing film scripts. So the scifi short story world is always very eager to read when a story of hers appears. This collections revolves thematically around the idea of apocalypses, endings, both literal and metaphorical, both in the epic scifi sort of way, and in the ordinary individual’s self-implosion sort of way. Cover comment: Fantastic design that makes the book look old and battered, but isn’t in fact. Very cool. Daryl Gregory and I won the same award (the Crawford Award) for best first fantasy book. Different years, of course! His first novel, Pandemonium, reminded me of a newish, leaner, sometimes scarier (is that possible? or unpossible?) Stephen King. His follow-up novels were just as good as the first, but I’d never read any of Daryl’s short stories until this collection came out from Fairwood Press last month. The stories range from good to great, and a couple are straight-up knockouts. Really idea-oriented speculative fiction that doesn’t lose sight of its characters and the human drama unfolding around them. Cover Comment: Fantastic. This is a wonderfully weird piece of art. If Gregory’s previous books hadn’t already sold me on him in general, I would have bought this book for the cover alone (yes, I’m one of those sorts). 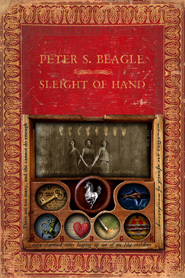 Does Peter S. Beagle really need an introduction? Probably for some. Can’t I just say, The Last Unicorn, and leave it at that? (And if you haven’t read The Last Unicorn, do yourself a favor and get it too). 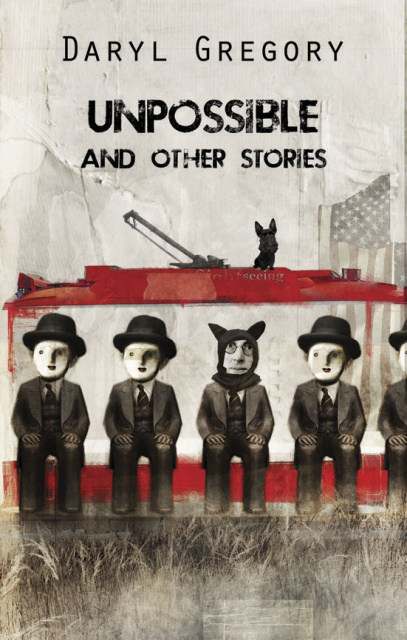 Beagle has made something of a comeback in the last decade, publishing several short story collections with Tachyon Publications, and all of them bear the hallmarks of his wit, wonder, and deep sympathy for ordinary characters caught up in extraordinary fantastical events. This particular collection seems to revolve mostly around magicians, dragons, gods and enchantresses. There’s light and dark both in these stories, a wide range of types of fantasy stories. Cover Comment: Gorgeous. That is all. Now, go forth and buy short story collections as gifts. For yourself, and for others. Because, really, collections rock, and these ones are killers. Dang. I should have given you a copy of the Triangulation: Last Contact anthology. 28 spec fic stories (27 original, 1 reprint) by up and coming writers, e.g. Deborah Walker, David Sklar, Amanda C. Davis (Western Pa gal), Jaime Lee Moyer, Cynthia Ward, Shanna Germain, Aaron Polson, Amy Treadwell, Nathaniel Lee, Desmond Warzel (a cool robot pilgrim story) and a wonderful steam punk story from new writer Charles Patrick Brownson along with a reprint from Robert Sawyer. Not in the same league as the writers you mention above, but it’s a strong sampler of semi-pro talent, well reviewed at Tangent. Available at Amazon, BarnesAndNoble.com for those early adopters out there who like to discover authors before they’re big name. I’m a fan of Maureen McHugh’s work, and most of Peter Beagle’s. I’ll have to check out Daryl Gregory. Thanks for giving collections a boost in your blog. Collections do seem to be a difficult sell these days, which is odd given our faster than light life speed.